Pocillopora eydouxi Milne Edwards & Haime 1860, Brush or Antler Coral. Distinctive large, upright branches with light-colored ends. A common species over its wide range. Large stand in the Andaman Sea (Similans, Thailand) at right and an aquarium colony. Close up, 1 meter colonies in Bunaken and colonies in Hawai'i below. 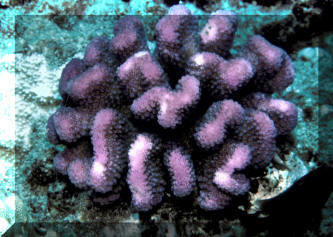 Pocillopora meandrina Dana 1846. Flat, short, curved branches, small verrucae. Regular arrangement of branch growth, verrucae placement. At right: Bunaken/Sulawesi/Indo. and Hawai'i close-ups, and two images of this common species in Hawai'i below.